The Milky Way may have 13.6 billion years under its belt, but its stars range from newborns to ancients. Astronomers mapped how old the stars are, creating the first-ever age map of our galaxy—and this map could give us clues about how life in the Milky Way started. The map, unveiled today at the 227th annual meeting of the American Astronomical Society, confirms the long-held belief that our galaxy evolved from the inside out, with older stars sitting toward the galactic center. But that’s just the first piece of a much bigger puzzle. As astronomers continue adding data, this map could help us piece together how the building blocks of matter formed and moved about over cosmic time. Using data from the APOGEE survey and the Kepler Space Telescope, Melissa Ness and Marie Martig of the Max Planck Institute in Germany determined the age of nearly 100,000 red giant stars throughout the Milky Way. “This opens up the possibility of combining ages with all of the chemistry of stars, and mapping that in unprecedented detail across the Milky Way,” Ness told Gizmodo. Even five years ago, constructing an age map like this was impossible. Despite troves of data on the luminosity of stars in the sky, we were missing key information that would help us determine stellar age. But then the Kepler mission came along, and it gave us something very interesting: stellar mass. 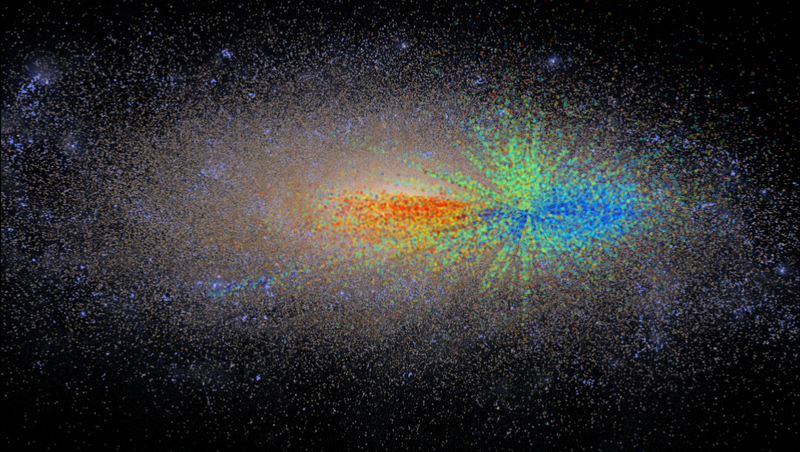 “The Kepler dataset gives you the mass of stars,” Ness said. “From mass, you can deduce age using stellar models.” That’s exactly what Ness and her colleagues did, for approximately 30,000 red giant stars in the Kepler dataset. Still, the Kepler mission only looked at a tiny portion of the sky. To get the ages of stars across the Milky Way, Ness turned to APOGEE survey, which studied the light output of over 100,000 red giants throughout the galactic bulge, disk, and halo. By matching APOGEE data with Kepler data, she created a model that shows how a red giant star’s brightness changes with mass. Ness then applied her model to roughly 70,000 APOGEE stars that are not in the Kepler database. Using only a star’s luminosity, she was able to infer mass, and from there, calculate the star’s age. A star’s light spectra can also tell astronomers what it’s made of—is it mostly hydrogen and helium, or is it filled with the heavier elements that form during nuclear fusion? As the APOGEE 2 survey continues collecting data on different stars across the cosmos, Ness hopes to add more information to her map, not just on age, but also, stellar composition. It was Carl Sagan who famously observed that we’re all just well-organized star dust. Now, we’re finally on the cusp of rising to Sagan’s unspoken challenge—piecing together the long road from elements forged in stars to living worlds like Earth.